SATURDAY — Anyone who's been covering North By Northeast for a few years is bound to have noticed that plenty of the week's best events aren't on the festival's own schedule. Instead, they're spread by word of mouth and Facebook invites, the rooftop concerts and parking lot BBQs and sweaty house parties that make the week about more than just the official events. That's how we ended up spending our Saturday afternoon in the basement of a house on Manning. The party was billed as an anti-NXNE event — thanks to the PWYC admission, the bands were actually going to get paid, something that can't be said for most of the acts playing the festival. And it just happened to feature sets by a couple of the groups we'd been most blown away by over the previous couple of nights. Seeing them play again while drinking beer in a stranger's basement sounded like a pretty damn fine way to spend a day. Stella Ella Ola kicked off our afternoon, playing their ridiculously catchy power-pop bathed in the glow of the Christmas lights hanging from the low ceiling. 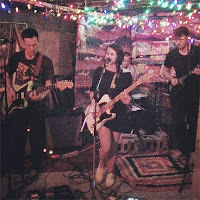 Their set was as tight and upbeat as the one they'd played Thursday night at the Silver Dollar, but this time they played it to a couple of dozen people crowded together between the basement's concrete columns. 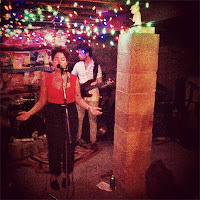 The audience bopped and bounced along to the tunes — including the group's brilliant new single, "Donna", bound to be one of our songs of the summer of 2013 — as body heat drove the temperature up and people downed their beers. "I feel like I'm just sweating booze," frontwoman Anne Douris joked. "Because that's exactly what's happening," Jake Boyd, the bassist, shot back, "I'm not going to remember anything I said all weekend." Next up were Weaves, who had knocked us on our asses the night before at BLK BOX, the first act of the Young Lions Music Club showcase. 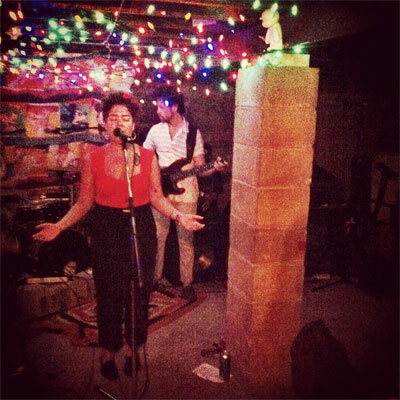 Their set in the basement was even better, starting off slowly but then gaining steam like a rumbling locomotive. Jasmyn Burke delivered her eclectic vocals over the driving drums and bass while Morgan Waters squealed away on his guitar. By the time they reached the end of the set, they had the people at the front of the small crowd dancing. "We're all from Toronto," Burke explained as an introduction to their final song, "where everybody fucks each other. So I thought I'd write a song about... having fun." Then she launched into "Motorcycle", their very best song to date, and the perfect end to an afternoon spent underground. Then it was back upstairs and out into the sun. We made our way to Bellwoods for the Great Heart Festival — and then, finally, to a night spent at real NXNE shows. But two of the best sets we saw all day weren't part of the official festival at all.